APA Group has extended the closing date for its takeover offer for Hastings Diversified Utilities Fund to 30 April, and waived five of the conditions of the offer. However, acceptances for the take over are not going well with APA having lifted its holding by 0.4 per cent to 21.1 per cent. AMP has further reduced its holding in DUET Group from 11.8 to 10.5 per cent. Hastings Diversified Utilities Fund has again advised security holders to reject the take over offer by APA Group, despite APA extending the closing date to 30 April, and waiving five of the conditions of the offer. Shares in Tox Free Solutions achieved a 10 year high of $2.81 on 22 March. Managing director Steve Gostlow sold 366,000 worth of shares on 16 March at an average price of $2.65. Tox Free said the sale was undertaken to fund the conversion by Mr Gostlow of 366,000 options at $2.07 each as previously advised to the market, and to enable Mr Gostlow to pay the upfront tax that was incurred due to the previous issue of options to him. The new shareholder approved Long-Term Incentive Plan gives the board discretion to grant performance rights and/or share appreciation rights to certain executives that will vest subject to the satisfaction of performance hurdles. Shareholders also approved an amendment to the existing Employee Share Option plan to allow for cashless exercise of options. This enables a participant to exercise their vested options not by paying the exercise price, but by choosing to receive the positive difference between the exercise price and the share price in shares. The number of shares allocated is based on the share price at exercise. Tox Free said that post sale Mr Gostlow's share holding is 1,122,638 shares and "he remains fully committed to the long term growth of the company". Nippon Gas Co has become a 9.7 per cent shareholder in Clean TeQ Holdings following a $2 million placement of 14 million shares at 14.6 cents each. The funds are primarily for working capital as project activity increases in the company's air and water divisions. They will also support identified new opportunities, particularly in Japan where the relationship with Nippon Gas is said to be proving highly prospective. The placement follows the formation of Associated Water Pty Ltd, a 50:50 joint venture between Nippon Gas and Clean TeQ to provide water desalination in the coal seam gas industry. Associated Water will use Clean TeQ's Continuous Ionic Filtration (CIF) technology as the basis of the desalination processes. Nippon Gas has invested $4 million in the joint venture and Clean TeQ has licensed its CIF technology. Clean TeQ CEO Peter Voigt said "This support from Nippon Gas will enable Clean TeQ to accelerate the market entry of its extensive technology portfolio into new sectors and geographies providing shareholder value following many years of investment in research and development." Nippon Gas president and CEO Shinji Wada said "Clean TeQ owns technologies that can help in the alleviation of many of the world's environmental issues, and Nippon Gas sees many opportunities for collaboration between the companies in the Australian and Japanese markets." Nippon Gas is a Tokyo listed company that manufactures and sells liquefied petroleum gas, utility gas and gas-related equipment in Japan. Nippon Gas is one of the fastest growing gas utility companies in Japan and has 2011 revenue of $1.2 billion. August Investments has told shareholders it sees some hope on the horizon despite the times being difficult for sustainable energy investments and equity investments in general with the All Ordinaries Index down 15 per cent over the last twelve months. "Many of the shares we invest in are now so low that they represent exceptional value, indicating that further falls are unlikely, all things being equal," said managing director, Damien Lynch. "Second, the Federal Government's Carbon Trading legislation, the $500 million Low Emission Technology Demonstration Fund and the $100 million Renewable Energy Development Initiative all cut in from July this year. These industry assistance funds must have some impact upon some of our investments in sustainable energy. "Government initiatives, however, typically take some to time bear fruit. At the same time speculators will attempt to double guess where the benefits will be. We already note volume and prices increasing in some such equities. We could be in for a wild ride." However, "The August Investments portfolio will not be chasing winners'. Rather, we consider our current portfolio is well positioned to take advantage of developments as they occur," he said. Mr Lynch also comments that the universe of sustainable energy investments is shrinking rather than growing and profitable investments are getting harder to find. "This is especially so since we sold all our investments associated with Coal Seam Gas (CSG). These included Origin Energy, Santos and AGL Energy. Likewise for Lynas Corp, which may not be as clean and green as we originally thought. CBD Energy has not lived up its own hype and we have reduced our holding in that company." "While there are many speculative investments (and we have small holdings in a number of these), the only profitable investments we have in this area are Energy Action Ltd and Carbon Conscious Ltd. The first, Energy Action is newly listed, but has already paid its first dividend of 3.5 cents per share out of earnings of 9.6 cents per share." "Looking at other environmentally positive investments, an unlikely candidate is Qube Logistics, chaired by Mr Chris Corrigan. Qube is a transport logistic company which is unifying disparate sectors of the industry. It is developing new intermodal hubs' which will streamline freight transport in Australia. This involves a dramatic expansion of rail infrastructure (it already operates its own rail fleet) and its aim is to move as much freight off roads and onto rail as possible. "It's largest such project is the Moorebank transport hub being developed on 83 hectares in southern Sydney linking a dedicated rail line to Port Botany and the main southern rail line. This development is expected to remove more than 18,000 truck movements per week from Sydney roads, reduce greenhouse gases and improve overall air quality. Qube has similar developments in other Australian states. Average profits have increased 61% pa over the last five years, with dividends growing as well. "Other investments with social and/or environmental benefits are Bendigo and Adelaide Bank and Tassal Ltd (fish farming)." "With this reduced list of dividend paying socially and environmentally positive investments to choose from, we have made a number of investments in neutral' investments which pay healthy dividends. Our research has identified investments which have a sound financial position, have exceptional value compared to their share price and provide a high dividend yield. Such investments are JB Hi-Fi (a highly successful retailer with a low share price), IOOF Holdings (financial services), Technology One (computer programming and support to all levels of governments and to business) and TPG Telecom (one of Australia's fastest growing telecommunications providers with their own international distribution network)," said Mr Lynch. Australian Renewable Fuels has appointed Deborah Page AM as a non-executive independent director. Ms Page has also been appointed chair of the company's Audit Committee. Ms Page has diverse financial expertise from operational executive roles in finance and her professional background in external audit and corporate advisory. She was a partner in Touche Ross/ KPMG Peat Marwick until 1992, and then held senior executive positions with the Lend Lease Group, Allen Allen and Hemsley and the Commonwealth Bank. Ms Page is the current chairman and independent director of Investa Listed Funds Management Limited, the responsible entity of Investa Office Fund, and is a non executive director of Service Stream Ltd. She is also a non-executive director of The Colonial Mutual Life Assurance Society Limited and Commonwealth Insurance Limited. She has previously been a non-executive director of Macquarie Generation and chairman of the Cancer Council of NSW and Ascalon Capital Managers. While there has been an expected level of losses during the early life stages to juvenile weight in the 2012 spawned tuna, Clean Seas Tuna says it is encouraged that the survival rate has stabilized from the strategy of holding juveniles in on-land facilities. The company currently has 160 tuna juveniles at 30 grams, an improvement on last year at the same stage of development and losses are lower than previous years. The strategy has seen a marked stabilization in survival and the company is optimistic that this is a suitable model for holding tuna onshore for release into sea pens in the spring. In the past few weeks, it has successfully weaned the juvenile tuna onto a manufactured diet that they gave accepted well. Green Invest shares reached a one year high of 7 cents on 21 March. The company said it anticipates that over the next few weeks it will make a number of announcements setting out further details about initiatives it will implement over the coming months. The initiatives have taken some time to develop and most of their establishment costs were booked in the 31 December 2011 accounts. "The company believes that these initiatives will be a fundamental component to its future direction and will include various financial products for both domestic and commercial customers. The initiatives will further enhance the Green Star' suite of brands developed by the company," it said. "The company is also interested in establishing a sustainable food division, which will complement the existing water and energy businesses. The company has appointed Domain Capital, to assist in evaluating a number of potential corporate opportunities, which would see the company being able to expand in each of its strategic areas. "The company intends to focus its business model on these three main platforms of sustainability  water, energy and food." Utilities management provider, Intermoco has appointed Kiril Ruvinsky as a director. Mr Ruvinsky is a licensed financial advisor who holds a Bachelor of Business Degree and is a member of the Financial Planning Association of Australia. Mission NewEnergy Mission has received a letter from Nasdaq saying it will be de-listed on March 29, unless it appeals the decision, for failure to comply with the Nasdaq Global Market's US$50 million minimum Market Value of Listed Securities (MLVS) requirement. Mission first announced its non-compliance with the MLVS requirement on 21 September 2011. As at 20 March, Mission's MLVS was US$5.8 million. Mission intends to appeal the decision and request a panel hearing to discuss its plans to regain compliance. If the panel does not grant the company's request and its stock is de-listed, the securities may not be quoted on the over the counter market. Instead, Mission will maintain only its ASX listing. Po Valley Energy produced 28.9 million cubic metres of gas in 2011, 8 per cent more than in 2010. Revenue was 9.11 million ($12.2 million), an increase of 27 per cent from 2010 when it was 7.16 million. Cash at bank at 31 December 2011 was 1.89 million ($2.4 million). Chief executive Giovanni Catalano said "The increased operating revenue and results reflects continued growth in gas production, higher realized gas prices and achieved operating efficiencies which gave rise to improved operating margins. "These operating improvements would have resulted in a net profit of circa 0.8 million but for the company's decision to write down the carrying value of its Castello field." "The company successfully drilled the Vitalba1dirA well at Castello in late 2011 and recommenced production in February this year at an initial rate of 15,000 cubic metres per day. We expect to increase to 17,000 cubic metres per day over coming weeks." Geological modeling of the reserves is currently being finalized however there is indication that the optimal operation of the field will be achieved by producing at a lower level compared to previous estimates in order to maximize long term production. How confident is WestSide Corporation chairman Angus Karoll that the indicative take over offer by LN will proceed? Mr Karoll has sold 1 million shares at 45 cents each, a handy $450,000. Mr Karoll advised that the sale was to, among other things, release some funds to assist with buying shares under the company's current and fully-underwritten 2-for-5 entitlement offer. Mr Karoll retains a directly and indirect interest in 16,312,770 shares and 310,000 options. That would entitle him to 6,525,108 shares under the offer. At 25 cents each that would cost a not insignificant $1,631,277, which is not the sort of cash most people would have handy or at short notice. Selling shares at 45 cents and buying them back at 25 cents makes sense. Meanwhile, the company's new Pretty Plains 10 dual-lateral well is flowing gas at a rate of more than 1 million standard cubic feet a day (scf/d) and with potential to increase further. Lynas Corporation has drawn attention to media reports that the prime minister of Malaysia said the Malaysian Government has decided to set up a Parliamentary Select Committee (PSC) in relation to the Lynas Advanced Materials Plant (LAMP) in Malaysia. The proposal is that the committee will be headed by the Higher Education Minister, and it is expected to report by the end of June. Lynas said it was also reported that the prime minister said that the PSC will not decide the approval and ongoing operation of the LAMP but that the purpose of the PSC is to continue to help raise awareness concerning the LAMP. Lynas said that in 2008, following a rigorous review, it received Department of Environment (DOE) approval of its Environmental Impact Assessment for the LAMP. In 2011, the Malaysian government arranged a further independent review by the International Atomic Energy Agency (IAEA), and its recommendations have been accepted by Lynas and the Malaysian government. "The IAEA concluded that the LAMP, once completed in the second quarter of this year, is expected to be safe and fully compliant with international standards, and that Malaysia's laws and regulations regarding radiation safety are "comprehensive" and "conform to IAEA standards". It added that in some cases, Malaysia's regulations are stricter than internationally accepted safety standards," said Lynas. Dyesol has had two advances in built in photovoltaics in USA and Korea. In the US, Dyesol has assembled prototype dye solar cells (DSC) into a panels over 1.2 metres by 0.6 metres in size, which it says is the largest continuous substrate, single circuit series connected DSC device made to date. Dyesol Inc, a US subsidiary and joint venture partner in the Toledo startup DyeTec Solar, said the team overcame challenges associated with the assembly of large glass-based dye sensitized solar cell panels for building integrated photovoltaic (BIPV) applications. The size was only limited by available prototyping equipment and utilized the JV partners' Transparent Conduction Oxide (TCO) glass and DSC materials, said Marc Thomas, chief executive officer and president of Dyesol Inc.
"These developments confirm that future products can be produced in relatively "low tech" manufacturing environments, compared to the typical clean room environments often associated with many other solar technologies, thus leading to reduced overall production costs." But there remains significant work prior to commercial deployment, he said. In Korea, the next generation of dye solar cell windows was showcased at the Human Resource Development Centre in Seoul. Dyesol said the windows demonstrate that not only can DSC applications turn buildings into power plants, they also create enormous opportunities for architects to design clean energy generating buildings that are at the cutting edge in style. Manufactured by a large Korean glass fabrication company specializing in window and door systems, the windows employ a glass treatment to create what Dyesol says is a beautiful and funky geometric pattern - a modern-day stained glass window generating clean, renewable electricity from sunlight. Enerji has installed the first heat recovery unit at the Carnarvon project in WA as part of its Opcon Powerbox waste heat to power system. Recent cyclone activity and weather delayed installation by a month due to the reliance on cranes to lift units into place over the top of the existing power plant. Other work at the site is progressing as expected including assembly of the cooling tower, concreting and installation of water pumps and pipe works. Commissioning at the Carnarvon project is now expected at the end of April. Revenue will be generated through selling the electricity created by the Opcon Powerbox, which has the capacity to increase the power station's output by up to 700 kW without burning additional fuel or creating emissions. Green Rock Energy has restructured its board and received commitments for $1.5 million through a second tranche placement of 300 million shares to sophisticated investors. The placement was organized by Cygnet Capital. The first tranche was $500,000 through a placement to sophisticated investors at 0.5 cents per share on 30 January 2012. All capital raised by Cygnet Capital attracts a 6 per cent fee of $120,00 plus GST. Green Rock will also issue Cygnet Capital 40 million options exercisable at 1.2 cents per share before 31 January 2015. * The joint venture with New Standard Energy (NSE) for hydrocarbons in the Canning Basin in WA including the 15 per cent interest in EP 417, the potential interest in the adjacent Seven Lakes SPA and other opportunities that may emerge under the Area of Mutual Interest with NSE. venture funding for the Mid West Geothermal Power Project. * The geothermal joint venture with MOL in Hungary. Green Rock has appointed a business development advisor, Mr Andy Carroll, to source hydrocarbon assets complementary to its portfolio. 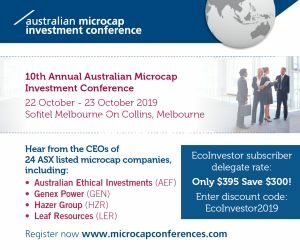 Mr Carroll is the founding managing director of consultancy company Australasian Energy Pty Ltd, a founding director of public unlisted company Phoenix Oil and Gas, and has 34 years experience in the oil and gas industry. In addition, it has appointed a new non executive director. Mr Gabriel Chiappini owns and manages consulting company Laurus Corporate Services, which provides ASX, director and company secretarial advice to ASX listed companies. Mr Chiappini is a non-executive chairman of Dromana Estate Ltd and company secretary of numerous listed companies. He has a Bachelor of Commerce with a double major in accounting and finance and been appointed by Green Rock to apply a high level of corporate expertise to the board. Adrian Larking has resigned as director of Operations with immediate effect but continues as a consultant to the company and a member of the Geothermal Advisory Committee. Kimberley Rare Earths hired an M&A advisory firm to review strategic merger and acquisition opportunities to complement its rare earth exploration and development activities at Cummins Range in WA and Malilongue in Mozambique. Managing director Kerry Parker has acquired another 500,000 shares at an average price of 1.5 cents each. Petratherm says preliminary testing for wind and solar resources at its proposed $1.5 billion Clean Energy Precinct in northern South Australia has revealed excellent results. The testing shows wind speeds of up to 8 metres per second at 100 metres height, which has the potential to facilitate a 300 MW wind farm. It also indicates a world-class solar resource estimated at 20 megajoules per square metre daily. The testing was undertaken by Garrad Hassan Pacific, the world's largest independent renewable energy consultancy. Managing director Terry Kallis said he is excited by the wind and solar results that build on recent independent testing confirming a major geothermal resource at the company's nearby Paralana project. "We have always been confident of the wind, solar and geothermal resources we have access to within the Precinct, but it is always good to have our own views backed up by independent assessments," said Mr Kallis. "We are also confident of securing a competitive gas supply and access to capacity from the Moomba to Adelaide gas pipeline which runs directly through the Precinct. "It's still early days for the Precinct but we remain firmly on track to combine new power generation facilities across gas, wind, solar and geothermal to eventually produce 600 MW of reliable, competitively priced electricity to meet anticipated demand from large mining developments in SA." Mr Kallis said the Precinct will initially focus on gas and wind power generation before expanding to solar and geothermal as these technologies develop as lower cost alternatives. Strategic Elements is to separate its rare metal assets into two subsidiaries - one will develop rare earths assets, the second will focus on tungsten and gold. The rare earths company will have a very large reward versus larger risk potential, albeit in a sector with longer development time frames; while the tungsten gold company will be in sectors with shorter development timeframes with a balance of tungsten, a critical rare metal, and gold, a well understood metal in demand in times of uncertainty. Options for Strategic Elements include a financing or sale of rare earths and/or a tungsten/gold subsidiary or a separate listing on a recognized stock exchange. Such an event would suit environmental investors. 100 per cent owned entity Strategic Materials Pty Ltd will continue to develop rare earths projects. A new entity will hold the tungsten and gold assets. Strategic Elements believes that the rare earths sector (with a focus on heavy rare earths) can provide significant potential upside within the constraints inherent to the industry such as processing and environmental. It is confident the discovery of new sources of heavy rare earths has the potential to add value. The restructure stems from Strategic Materials securing exploration rights to the Wicklow Tungsten Block 60 kilometres south west of Dublin in Ireland. The company said the timing of the grant is important due to a notable increase in the tungsten price to US$44,000 per tonne and concerns over the dominance of Chinese tungsten production and exports. The Wicklow Tungsten Block contains an extensive tungsten system potentially up to 10 kilometres in strike length. Two companies have previously invested significant time and resources to advance the project to the drill testing stage. Strategic Elements says it will benefit from the extensive work and expenditure already invested in the project. Several board change have occured at Torrens Energy. Dr Dennis Gee and John Canaris have resigned. Mr Winton Willesee has been appointed a director. Anthony Wooles, who was appointed as a director in February 2012, is the new executive chairman. Dr Gee served as an independent director for five years and Mr Canaris served as managing director for six years until he stepped into a non executive role in February 2012. Water Resources Group (WRG) has reported that site preparation work has commenced in Cape Verde to support the Water Offtake Agreement between the Municipality of Santa Catarina and Blue Aquifer LDA. WRG owns 49 per cent of Blue Aquifer. WRG worked with representatives from Catalana de Perforacions in Spain to conduct reconnaissance for seawater intake and brine discharge sites around the island of Santiago in Cape Verde. Investigations included underwater surveys, and water and sediment samples in conjunction with the measurement of key parameters for the intake and outfall design process. Preparations were made for the next phase of the geotechnical investigation which will include marine geophysical mapping and investigation of the sub-bottom geology to enable the installation of a Neodren infiltration system.